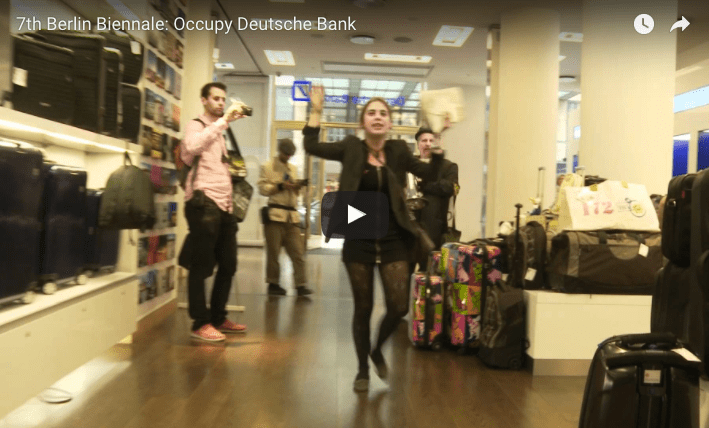 Arriving at the “Occupy Biennale,” the Occupy section of the Berlin Biennial, was shocking. Although interesting lectures and discussions were held in our ground-floor space, architecturally it was a sunken pit, a fishbowl. Visitors could enter and stand on an elevated viewing platform to observe the occupiers go about their activism. Seemingly unaware of the institutional frame within which they were viewed, the occupiers who had organized and decorated the space painted the walls with slogans and hung banners to create a kind of Occupy themepark. We dubbed the space the “Human Zoo.” The setting was complicated further by a very strong curatorial frame, based on Artur Zmijewski’s desire to display only effective political action, and not “art” per se. Zmijewski, an internationally renown artist in his own right, has a track record of using people as marionettes and creating ethically and politically ambiguous scenarios. We were afraid we unwittingly agreed to play a role in his latest piece, an Occupy time-capsule and tomb that historicizes and deactivates the movement. In reaction to this stifling curated space within the Kunst Werke (KW) where the Biennial was held, our participation was present, future-oriented, and inviting. We scheduled our open action assemblies in the courtyard of the KW. After our first action, a pots-and-pans banging Casseroles at Deutsche Bank and the Canadian Embassy in solidarity with the Quebec student strike, the meetings attracted activists from around the world. Recognizing that our global crisis requires a global response, we drew on new international connections to develop a global action network that synchronized our actions with actions in other countries. We focused on targets outside of the Biennial including the Pergamon Museum, Deutsche Guggenheim, and Deutsche Bank. Our presence in the Biennial was limited to the occasional banner inviting people to actions and large action meetings in the courtyard that were open to the public. 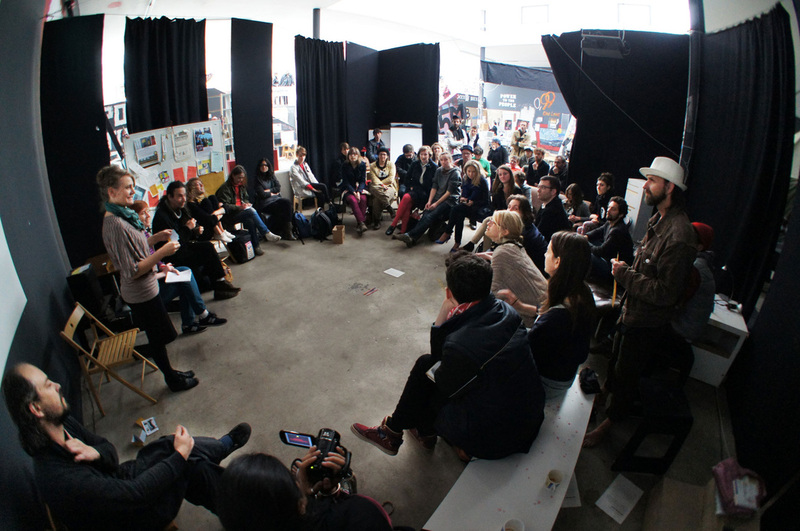 While our actions could perhaps leave the deadening frame of this Biennial, we recognized that we would need to address our role within it and could not leave the institutional frames unchallenged. The curators may have framed the show, but framing the curators were the staff of the Kunst Werke and its director, Gabrielle Horn. Framing the KW was the Kulturstiftung des Bundes, the Foundation for Culture, a German government fund for art. Each needed to be addressed together and separately. To address the curators, we invited Zmijewski to join our political actions throughout Berlin and stand with us against art world abuses. He showed up. To address the frame of the KW, we organized a meeting with all the staff and opened a space where workers could openly and if necessary, anonymously, share their grievances. The well-attended discussion ultimately focused on the below minimum-wage salaries of the museum guards and further work was pledged to examine the budget closely to determine how they could be paid more. We then submitted a proposal to the curators titled, “You can’t curate a movement,” calling for the Biennial and the KW to adopt a horizontal, non-hierarchical organizational structure. The curators would become the former curators and the director the former director, to be replaced by working groups operating within a consensus-based process. We consensed on the proposal and moved forward immediately, organizing assemblies and working groups. Meetings were convened to further clarify the budget, to discuss treatment and compensation of guards, and to determine the information available to the public on the Biennial’s website. The process for implementing this new horizontal structure has just begun, and a continuity working group that includes KW staff, Biennial staff, the former curators, occupiers, and members of the public are helping to oversee the transition. Working group meetings are open to all staff and the public. It is safe to say that we have not yet successfully implemented a non-hierarchical structure at the KW. But we are making progress, and perhaps it more importantly, we are experimenting with new tactics to challenge the corporate logic of cultural institutions. Indeed, if we want a democratic culture, we will need democratic cultural institutions. 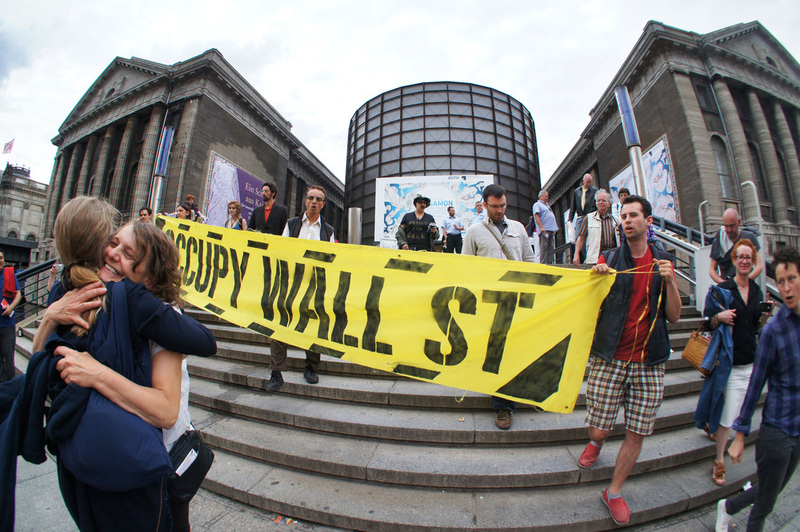 Occupy Museums has gained a great deal from this experience; new connections with activists abroad, a better understanding of European arts funding models, and experience pushing institutional boundaries from the inside have refined our vision and strengthened us.